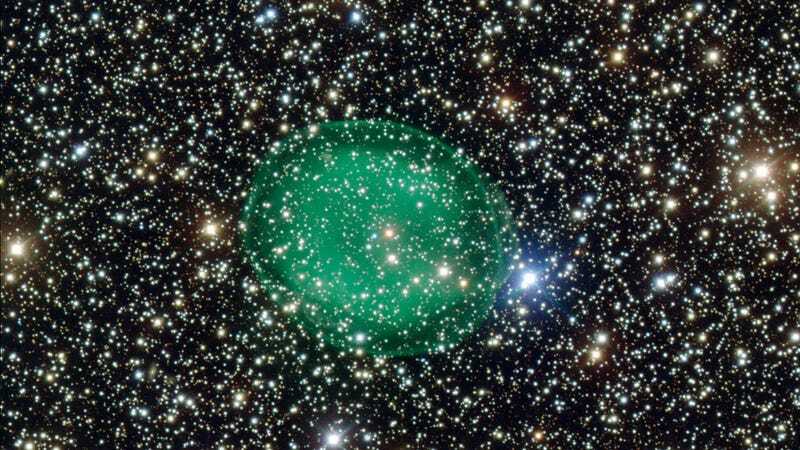 Could this be a cosmic-scale amoeba like the one encountered by the Enterprise crew in “Immunity Syndrome?” More likely, it’s the planetary nebula IC 1295 — a glowing green bubble made from gas that’s being blown out by a dying star. Nebula IC 1295 is located 3,300 light-years away and it sits in the constellation of Scutum (The Shield). The planetary nebula appears as a giant, glowing gaseous bubble, and it surrounds a dim and dying star that’s transitioning into a white dwarf. The aging star is blowing its atmosphere into space, the result of unstable fusion reactions. The outwardly emanating gas is bathed in strong, ultraviolet radiation from the star, which is what makes it glow. The green shade comes from ionized oxygen. All stars that are roughly the size of our own will go through this process; the bubble-effect will last for thousands of years. The bright blue-white spot at the heart of the nebula is the burnt-out remnant of the star’s core. It’s misappropriately called a planetary nebula on account of the time when Neptune and Uranus were thought to be similar phenomenon. This picture, the most detailed yet of nebula IC 1295, was taken by ESO’s Very Large Telescope, located on Cerro Paranal in the Atacama Desert of northern Chile, using the FORS instrument (FOcal Reducer Spectrograph).